Singam is the tenth film for which director Hari is wielding the megaphone. It also happens to be Suriya’s 25th film. With this combination turning out to be a great success earlier, the expectations for Singam have been on the rise. One more addition to this team is Devi Sri Prasad. A press note from Singam’s makers states that Hari-Suriya-Devi Sri Prasad will be joining together after a gap of six films. The trio, it may be recalled, had worked together in Aaru. 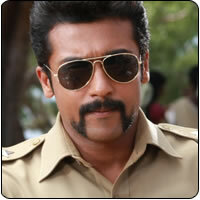 Singam’s audio will be launched by the end of this month and the film will hit the screens next month.